Action from Newtown's 51-14 win over NFA on Saturday. Luke Melillo and Dan Mason each ran for three scores as the Nighthawks pulled away from NFA 51-14 Saturday, lifting their record to 5-0. Out-of-conference games have not been kind to Newtown either in the regular season or playoffs over the past several seasons, but emphatic wins over Cheshire and now the Wildcats in the crossover series with the SCC and ECC have provided conference that a playoff run might be possible. The entire team circled the two games as a chance to prove themselves against non-SWC opposition. Mason carried 33 times for 197 yards to set the tone on the ground for Newtown, which scored 34 unanswered points after the first quarter ended with the schools deadlocked at 14-14. Melillo ignited a passing attack with several long completions, including three that went for more than 30 yards. A highlight-reel catch from Shea Talbot led to a touchdown that gave Newtown a 14-7 lead in the first quarter. 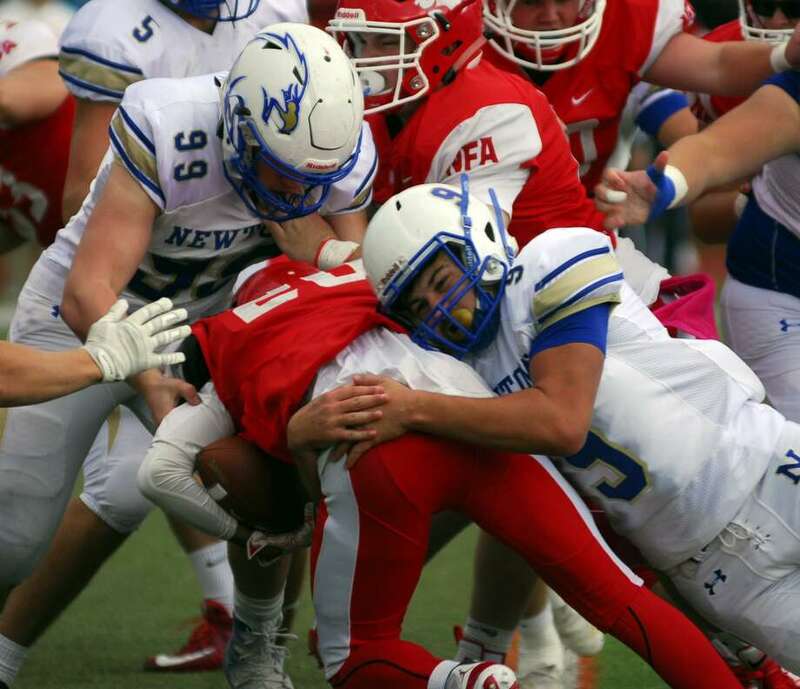 The defense tightened up for Newtown, which held a talented NFA offense off the board for three quarters. The Nighthawks forced four turnovers, including picking off three Elijah Parker passes. One of those came late in the first half with the Wildcats driving, as Joe Pagett picked off a pass in the red zone and returned it near midfield. One long competition set up a field goal by Devin O’Connell that gave Newtown a 10-point cushion. Parker had a touchdown run and threw a long pass to Dangelo Aristilde that turned into a touchdown after a teammate recovered a fumble on the goal line. The Wildcats moved the ball between the 20s for most of the game, but turnovers and unstoppable Newtown attack made the game one-sided. Luke Melillo, Newtown: The balanced offensive attack was led by the senior, who showed off his legs in wrapping up the win. Had touchdown runs of 10, three and 30 yards. Records: Newtown 5-0, NFA 3-2.